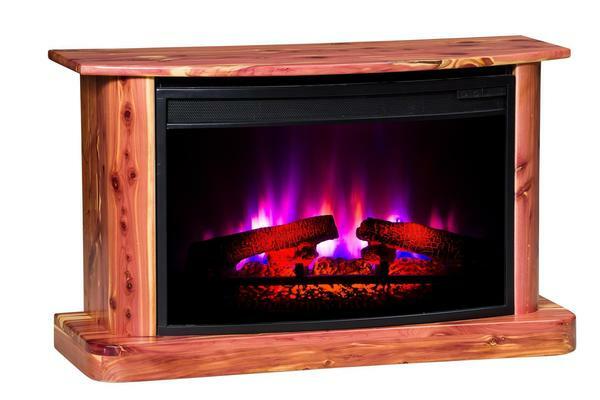 Add warmth and “surefire” romance to your home with the Amish Rustic Cedar Electric Fireplace. This LED fireplace is framed by an Amish handcrafted cabinet made from cedar and knotty pine woods. Control the temperature while curling up in an armchair, from your living room sofa, or while snuggled up in bed! All it takes is the touch of a button on the handy remote control. Enjoy the modernity of this electric fireplace, complemented by old world craftsmanship. The romance of a hearth, without having to stoke the fire is an attractive option. Hidden casters allow this Amish made electric fireplace to move easily from room to room. How's that for convenience? Create a cozy spot to gather with family and friends for some hot chocolate and warm memories. Take a look at our complete collection of Amish Fireplaces to find the one you like best. Give us a call today! We are happy to help. 1-866-272-6773. Fireplace insert heats 1000 sq ft and has 5200 BTUs.